The very first shot of this episode is Bruce burning his mask. He thinks he has to get back to being the philanthropic Bruce Wayne to get Alfred back, which kicks off an episode that features a pretty satisfying emotional arc for the future Batman. Two of Gotham’s most powerful women, Sofia Falcone and Lee Thompkins, meet up to discuss terms for cooperation. Sofia wants the Narrows to pay a 30% tax, and Thompkins knows that’s unreasonable. Their power struggle doesn’t last all that long, because by the end of the episode Sofia’s won over the Narrows, put Thompkins in the hospital, and is now that much closer to controlling all of Gotham. Sofia’s rise to power is so strange; it’s integral to everything going on this season, and yet it’s also largely played out in the background. A lot of the power struggles in this episode are interesting, but Ivy’s whole storyline is lacking anything intriguing. There’s one good scene where Selina confronts her old friend and stops her from making more killer plants with the last of the Lazarus water, but I remain wholly uninvested in Ivy’s vague vendetta against the people of Gotham. 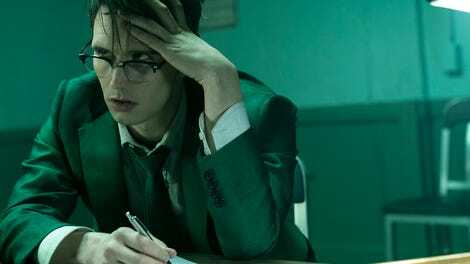 As the episode title suggests, there are a number of reunions this week: Bruce and Alfred eventually make up, Gordon and Bullock seem to be on their way to mending their partnership and friendship, and Nygma, as the Riddler, is back with Cobblepot. Allowing these character dynamics to return could be a boon for the show just one week removed from such a scattered, lackluster episode. While Bruce’s emotional arc is rather rewarding, I still can’t quit figure out Bullock. He seems to quickly admit to Gordon that he’s been holding a grudge for too long, and yet it doesn’t feel like the show is really exploring what’s eroded their relationship. Gordon’s admission at the end of the episode, to knowing about Sofia’s hiring of Professor Pyg, is big, but will it be used to create more tension? Is this admission all Bullock needs to truly forgive Gordon? We’re still not quite done with this storyline. 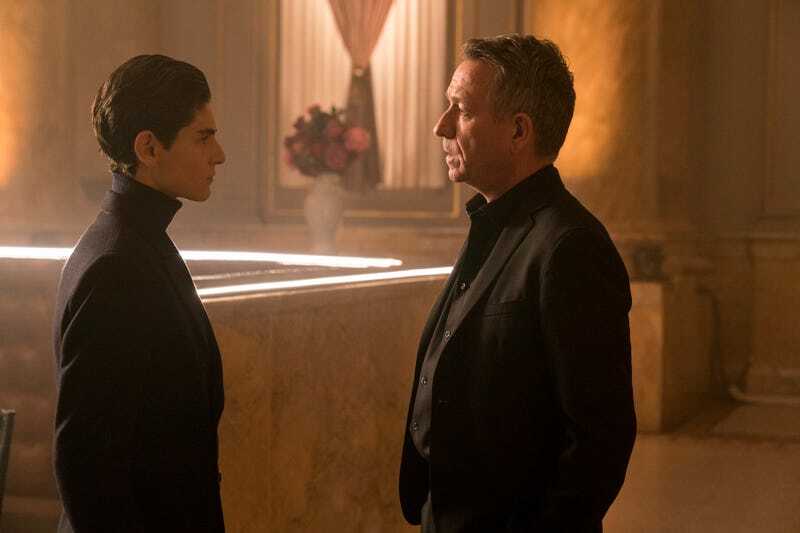 It would have been easy enough for Gotham to just have Bruce apologize to Alfred and then completely reset their relationship. Thankfully, Bruce’s journey here is much more satisfying. He realizes that he doesn’t have to go back to simply being Bruce Wayne to win over his former mentor; he has to be more than that. Alfred’s always pushing him to be better, to play a role that he’s destined for, and now he’s starting to understand that. It’s incredibly exciting watching Bruce make that transformation. Bullock almost goes looking for Ivy without his pants. Classic Bullock. If Bullock does end up back at the GCPD, we all have to pour one out for bartender Bullock, a man we all loved because of how many people he hated. A bartender with a healthy disgust for his patrons is a bartender you want to hold on to. It’s promising to have Nygma and Cobblepot back together again, though the looming presence of Jerome, and the potential of too many villain cooks in the evil kitchen, is a little worrisome. The whole plot could go off the rails at any moment. It’ll be a damn shame if Thompkins is reduced to a motivating factor for Gordon’s hero journey. Don’t do that, Gotham!